In this post, the National Security Blog breaks the fourth wall to share with our readers some observations after a morning on Parliament Hill before the House Standing Committee on Public Safety and National Security. 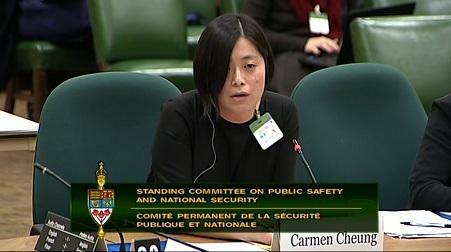 Yesterday was the first day of non-governmental testimony in the House Standing Committee on Public Safety and National Security’s study of Bill C-51. It’s always a privilege to be invited to Committee, and just between you, me and the internet, I’m always excited to go through the “Parliamentary business” door. I was the first witness to testify yesterday, and if you’ve been following our news these past few days, you’ll see we have serious concerns about Bill C-51. Our concerns are as far-ranging as the proposed legislation itself – from dangers posed to human rights and civil liberties to the effectiveness of these measures in protecting national security and public safety. We shared these concerns with the Committee in the hopes of assisting it in its study of this complex omnibus bill. The first question of the day also went to me: “Are you fundamentally opposed to taking terrorists off the streets?” This was, in fact, the only question Government MPs asked during the entire first hour of testimony. As Hansard will reflect, my answer to that question was “no”. (I also went on to make some further observations about why the BCCLA did not think Bill C-51 was the best way to “take terrorists off the streets”; you can watch the hearing here.) When I came out of the Committee room and into the media scrum, the reporters all wanted to know: What was your reaction when he asked you that question? And I’ll have to confess that at the moment, with a bank of cameras in front of me and microphones all around, I didn’t have a much better answer than the one I gave to the Committee. But this is what I should have said: The question reflects what appears to be a troubling tendency to ignore substantive critiques of Bill C-51 in favour of going after the credibility of the critic. And we saw it last night, when Ihsaan Gardee, the executive director of the National Council of Canadian Muslims had to respond to “questions” about whether his organization had “ties to groups that have expressed support for ‘Islamic terrorist groups’”. As he pointed out, “McCarthyesque-type questions protected by parliamentary privilege are unbecoming of this committee.” But instead of being able to address the substance of his organization’s concerns about the bill and its impact on the Muslim community, Mr. Gardee was forced to spend his time defending against a purely ad hominem attack. Bill C-51 is a bill deserving of real, substantive and serious debate. But it is difficult to have that discussion if critics are simply going to be subject to rhetorical attacks on their commitment in keeping Canada safe from terrorist attacks. In September 2001, President George W. Bush gave a speech officially declaring war on “terror”. With respect to whether countries around the world should support the American position, he famously said, “Either you are with us, or you are with the terrorists.” Today, as my colleagues are asking me how I felt after my testimony, this is the phrase that comes to mind. Next Post: Wait… there’s more! ELECTION TIME WHAT SHOULD ALL FREE LOVING CANADIANS TELL EVERY PARTY THERE MAIN CONCERNS ARE ????????? Everyone all ready knows who the terrorists are!! Where they are in Canada how they fund themselves, who else they fund, and they have already demonstrated, publicly what they think of our freedoms of life speach and way of life. The Government already has the means of dealing with these people and ridding Canada of these haters of our way of life.!! This bill will only hurt Canadians and leave a opportunity for total controll especially if the wrong people get into government.Does anyone in Canada ever remember a time in canada when there was so much threat or fear because of any other group of people or religion like this ?? Lets get real The government and the rest of Canadains know where the problems are leave Real Canadians and our rights and freedoms Alone!!!! ELECTION TIME WHAT SHOULD ALL FREE LOVING CANADIANS TELL EVERY PARTY THERE MAIN CONCERNS ARE ????????? 3) Using ‘Fear’ to try to stampede Canadians to support him and the Cons. I think Canadians have a lot more to fear from the effects of Climate Change, than they do from ‘Terrorists’. Existing laws are sufficient to use against terrorists. C51 is a dangerous knee-jerk reaction – much like the Patriot Act in the US, that sets the alarming possibility of interfering with the charter of rights and freedoms, and effectively gives CSIS carte blanche to go after anyone the government does not like, be it a bird-watching club, an opposition political party, or anyone critical of the government. Are you referencing the terrorists in parliament right now? Under C-51, liberals, conservatives and NDP have committed terrorist activities for political gain by using fear to intimidate and or coerce. That’s how vague C-51 is and that’s the true definition of terrorism, its political. Only in British dictionaries can you find a proper definition for terrorism that does not include the root word to describe itself. The one standing definition under American dictionaries states it as a political agenda through use of fear and intimidation… sounds awfully familiar doesn’t it. Respect my Rights. I have no choice but to respect yours. C-51 is an abomination that should die on the floor or in committee because it will subtract from my Rights and Freedoms but increase ‘yours’ as Government with little or no oversight or time limit. I honestly think that the “adults” in charge of the government, should be tried for treason, war crimes, theft, enslavement, destroying the ecosystem and tainting our food supply. I think they should feel ashamed, for not giving us a better school system. One that teaches us real world skills, not just who can copy and memorize the answers the best. Lets face it government dose not have any intention of creating a better standard of life for this country, we are a product, and so long as we can make someone money it would be bad business if we were all happy with good health and products that lasted multi-generations. This is no longer a democracy, this is who has the most money. Its only rich people or poor people. I no longer support my government or believe in it. I am ashamed of my role models and the parents who we grow up to emulate. The Youth are gonna wake up soon. We are gonna rib the fabric of society apart unless you step up and change from this police world, and help us fix the environment, fix the school, fix the healthcare system, destroy all the GMO foods, get rid of the pesticides, so that the environment dose not get away. Think about whats gonna happen if everything came to a head right now, and how all those super bugs/plants will spread like wildfire with nothing stop it. i want to inherit a world that is not bleak. Please I challenge you to set aside your greed/hate/ego and look to a better future, where we can enjoy the present moment. With respect, Ms. Cheung, your answer to that question, obviously meant to be provocative and divisive, should have been: “I won’t dignify that with an answer. What I will say is that this Bill is not the way to achieve that goal while preserving vital civil liberties that Canadians cherish.” Mr. Gardee wisely chose his answer in a similar vein. But thank you for having the courage to be there on our behalf. One of the most valuable aspects of Canadian citizenship is freedom of thought, expression and (somewhat) free assembly. Bill C-51 seriously threatens that. pipelines, you muzzle the scientists. pipeline or big oil you introduce this bill ( all without allowing proper discussion). The agenda is clear / the timeline is set / its all about the party (conservative party). To the question: ” “Are you fundamentally opposed to taking terrorists off the streets?” Not at all…as long as you take those most threatening first and that would be the little despot himself and his ministers; failing that then you, the government, have NO interest in taking terrorists off the street but are rather more interested in facilitating their rise to justify your fascist development.i.e. for one: the John Nuttall case. This government is knowingly and willingly taking us down the road to facsim. Everything that Canada was never about. I usually don’t care about politics but enough is enough. With the passage of this bill this comment could be seen as inciting terrorism. Where does it end…..History does tell us. The Government already has the means of dealing with these people and ridding Canada of these haters of our way of life.! Conservative rhetoric is fond of fallacious arguments. Is both an false dilemma (black and white thinking) and ad hominem (attacking the character of a person, instead of their argument). Just take the time to look up the various different fallacies, and then look at virtually ANY of their claims for why they’re ‘good’ for Canadians. You’ll see pretty quickly that as ‘decision-makers’, they certainly don’t explain their decisions with logic. A likely possibility, is because they don’t want to have to explain the REAL logic behind having a vague law that could easily discriminate against certain protest and ethnic groups, as well as cast a shadow on democracy where people are afraid to dissent. Or you know, they COULD just be too careless to change a few simple words. But which is MORE likely? Just because you’re elected dosnt give you the right to change our constitution and dictate what Canadians want. All major actions by the government, such as going to war, changing laws and deciding economic futures should be approved by the people before being ratified. Our democracy dosnt feel like democracy anymore. if I hear the word terrorist one more time im going fishing for cod in newfoundland…probably wont find any…prior to 911 I heard this WORD occasionally. ( had a roommate who said ” the rats in the house are terrorizing me ..he took their presence and stigma personally..
im for protecting the public from any kind of needless violence and kudos to those who do the work to make this so. but who was it that said if you sacrifice freedom for security you will end up with neither?? or do unto others etc. history is littered with violence. ultimatums such as with us or them..are useless in the context of history as the world and its battles and its politics are constantly morphing. action, reaction, one step forward one step back..an event observed can only hold in the minds and memories. then to the next event. over time the its our children who inherit the land..are our decisions benefitting them or ??? my parents endured the second world war and got over it and flourished in Canada. creating for the future..all things must be defined by a beginning or end. books,concerts,days,ice cream cones and especially wars.i have faith this will come to pass..with us or them ? who is them ? in grade 7 I was attacked by a bully, he got a lot of kids to come watch at the end of a day ( US ) I ( him,deserving victim ) won the fight. now the majority of the crowd saw this what to do now? im 55 im sure that the world has moved on.